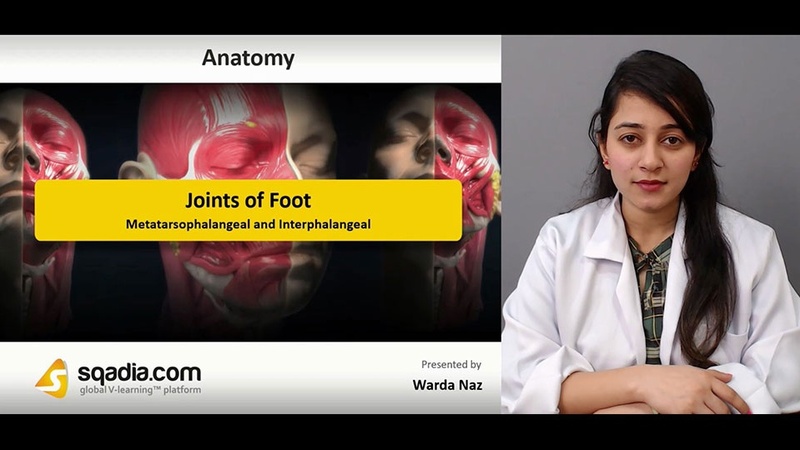 In this lecture ´´Joints of Foot´´ are explained. Section one is about ‘‘Overview’’. Earlier in this section, educator introduces bones of foot. Then anatomy of bones is described. Subsequently, information about small joints is delivered which include the elucidation of forefoot joints, midfoot joints, and hindfoot joints respectively. Section two is about ''Subtalar and Talocalcaneonavicular''. At first, educator talks about subtalar joint. After that articulation comes under consideration. type of joint is also discussed in this part. Moving onward, capsule of joint is elaborated. Subsequently, ligaments are discussed along with movements. Next emphasis is on talocalcaneonavicular joint. Later on, articulation is pursued. Furthermore, capsule, ligaments, and movements are explained in succession. Section three is about ''Calcaneocuboid and Cuneonavicular''. Initially, educator focuses calcaneocuboid joint. Then discusses articulation. Likewise, capsule, ligaments, and movements are explained. Afterwards, calcaneal fractures come under consideration. Furthermore, elucidation of cuneonavicular joint is given. Alongside, information about articulation is conveyed. Lastly, ligaments and movements are pursued. Section four is about ''Tarsometatarsal and Intermetatarsal''. Educator begins by explaining tarsometatarsal joints. After that articular surfaces are elaborated. Then capsule, ligaments, and movements are pursued. Following this, intermetatarsal joints are highlighted along with their articular surface, capsule, ligaments and movements. In this part, concluding comments are given on metatarsal fractures (dancer’s fracture). Section five is about ''Metatarsophalangeal and Interphalangeal''. In the beginning, metatarsophalangeal joint is discussed. Its ligaments and movements are also elaborated. Then hallux valgus comes under consideration. interphalangeal joints are elaborated later on. This is followed by explanation of articular surfaces, ligaments, and movements. Educator also sheds light on interphalangeal joint pain. In the end, gout foot is pursued.